effecting life on this planet now . . . and in the future. Learn what each of us can do to help. Water is essential for life. We need water to digest food and eliminate toxins and waste from our bodies. Water regulates our temperature, protects our organs, tissues and transports oxygen and nutrients throughout our bodies. Water lets us grow and heal. Helping to prevent diseases such as kidney stones, cardiovascular-related illnesses and obesity. Doctors and nutritionists regard pure water as the best drink for our bodies. Around the world, research evidence indicates that tap water can be impure. And there's no assurance that bottled water is any safer. Clearlly disposable water bottles are not "green friendly". . . they contribute to global warming . . . which results in more frequent and severe droughts . . . making the water crisis even worse. Clean, pure drinking water is needed throughout the world and is quickly becoming the most highly prized resource of all. 97% of the earth's water is in the oceans . . .
but It is undrinkable and unusable for most culinary and commercial purposes. Only 3% of the world's water is fresh . . .
with 2/3 of that being locked in glaciers and polar ice caps. Of the remaining 1%, about 1/2 is located beneath the earth's surface. The other 1/2 is found in rivers and lakes . . .
with a significant percent severely polluted or biologically contaminated. Pollution has begun to reach our underground water as well. 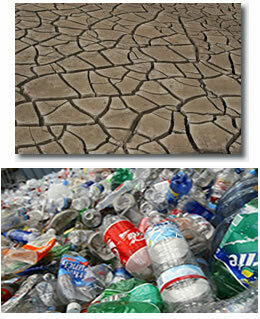 Plastic bottle production and disposal contributes to global warming. Global warming is causing more frequent and severe droughts. Recently the Environmental Protection Agency (EPA), the Center for Disease Control (CDC) and other environmental groups have commented on the shocking and dangerous state of public water supplies. They have said that the water quality in many of our public water supplies is being degraded by chemical, biological, and physical contaminants. Drinking ordinary tap water can be potentially fatal to people with a weakened immune system. Children, expectant mothers and the elderly are in greatest risk. As the news of this water crisis has spread, there has been an explosive worldwide growth in the sales of both bottled water and filtering devices, There is however, no assurance that bottled water is safe; and furthermore, of the over 2,000 different filter models sold to the public, only a handful actually remove all of the parasites, viruses, bacteria, pesticides and heavy metals that may be present in tap water. Cryptosporidium Parvum, for example is one of the protozoa, which most water systems are incapable of removing. This is the same parasite that killed 104 people and made 400,000 ill in Milwaukee. The Natural Resources Defense Council estimates that in the US alone . . . more than 900,000 people become ill each year from water borne disease . . . and as many as 900 will die. As bad as the situation is in the United States, it is worse in many other developed countries and to an even greater degree, second and third-world countries. Continually, on any given day, more than 1/2 of the earth's human population is ill, with the majority of these cases caused by waterborne contaminants. The World Health Organization of the United Nations estimates that 80% of this illness is caused by contaminated drinking water. Many countries throughout the world, not just third world countries, have inadequate water treatment facilities, or a complete lack of treatment facilities. It is becoming clear that new technologies are needed in every segment of the water treatment industry: agriculture, horticulture, food processing, industrial waste treatment, public water supplies, and sewage treatment. These systems must be environmentally-friendly and rely on methods and processes that are not chemically based. Fortunately, there is a new technology that offers a remarkable solution to the global water crisis. 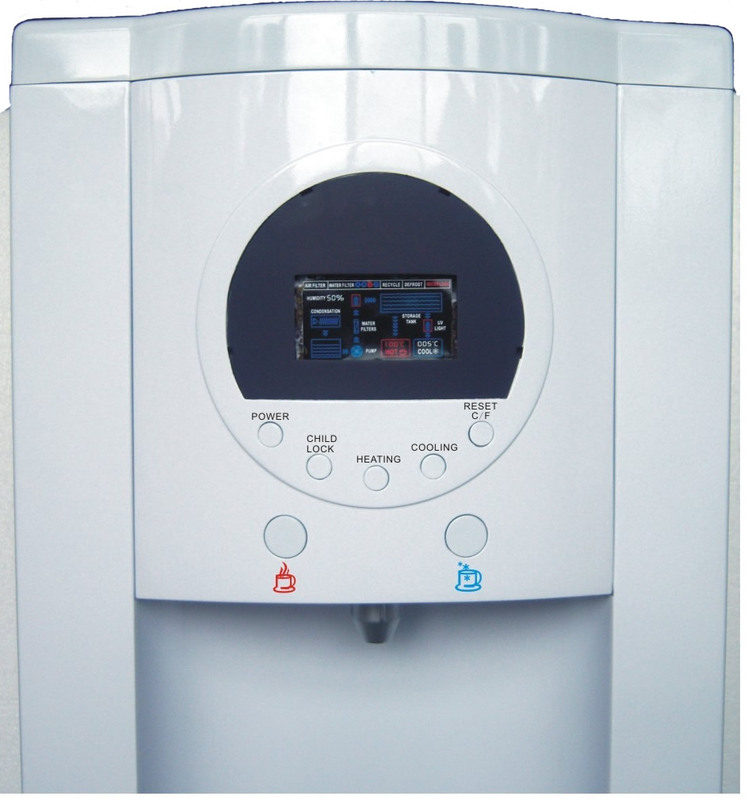 Air2Water; has introduced the Dolphin1 - - - an atmospheric water generator (AWG) which utilizes a revolutionary patented technology to convert ambient atmospheric water vapor into potable water. In other words The Dolphin1 produces pure drinking water . . . out of thin air. Designed with Air2Water's advanced proprietary ultrafiltration membrane technology, the Dolphin1 extracts, filters, treats and purifies water . . . all from the air we breath . . . providing pristine, sparkling clear water in the purest form - much like crystal-like dew found only on the purest mountain tops. The Dolphin1; machine first pulls air through an electrostatic filter, removing 93% of all air born particles. As the machine collects the water, it drops into a collection tray and immediately passes into Ultraviolet (UV) light, where the water stays in contact with UV rays for approximately 30 minutes. This kills over 90% of all germs and bacteria in the water. The water is then pumped through a sediment screen and then through 2 solid block activated carbon (SBAC) 1 micron filters, which removes over 90% of any volatile organic chemicals (VOCs) that may be in the water. The water is then filtered through air2water's proprietary ultrafiltration (UF) membrane, with a pore size of .015 micron, to remove virtually all bacteria and common viruses. The water is then pumped into a reservoir tank. From the reservoir tank, the water is recycled every 30 minutes through the UV and back into the reservoir tank. The water is then chilled or heated and dispensed at the consumer's convenience. This revolutionary technology is helping to meet the growing demand for economical, good tasting, quality drinking water. Atmospheric water generation is a green friendly, alternative water source, for anyone who wishes to maintain control over their own pure water supply. The Dolphin1 has been designed to perform at optimum levels, producing high quality water while consuming minimal electricity. Water produced by the Dolphin1 water generation machine is pure and safe for human consumption and exceeds the established U.S. and international Public Health standards, including NSF 53, which is the top U.S. benchmark for drinking water. The NSF 53 standard requires the removal of volatile organic chemicals. VOCs such as ether, which have proven extremely difficult to remove by filtration methods of the past, are not present in the water generated by the Dolphin1 water generation machine. The Dolphin1 represents our newest model of quality atmospheric water generation technology. The complete set of features of the Dolphin1 set it apart from any other machine available in the marketplace today. This hot/cold machine features superior logic, easy to read LCD display, and low energy consumption. With its municipal tap-in feature, the Dolphin1 is perfect for environments where temperature and humidity are seasonal. Our superior filter system ensures that the water dispensed is filtered through high quality filters, including one carbon filter, one sediment filter, a second carbon filter, a no waste RO filter or an ultra-filtration (with no-waste bypass), and a third carbon filter. The water is treated by two inline UV lamps and is re-circulated to ensure fresh tasting water when you need it. Re-circulation of all water in the system takes place every 90 minutes for 10 minutes using two separate re-circulation systems with individual UV lamps. Because the hot and cold water tanks use the latest coil technology the Dolphin1 uses less energy overall to provide you with hot and cold water on demand (see our detailed specifications below). Combined with its no-waste RO system (or optional ultra-filtration filter), the Dolphin1 represents the most fully featured and thoroughly thought through AWG design ever built. Recycle Mode: Sanitizes water in top storage tank on power up and every 12 hours during normal operation by passing the water through the cold water UV Light and then back into the storage tank for 2 minutes. Filter Replacement Warning: The unit will remind the end user to replace each filter as required. Filter replacement timers can be reset at any time, if the filters are replaced early. The Sediment, and 2x Carbon filters should be replaced every 6 months, and the Reverse Osmosis filter every 12 months. The filters are accessible from the front of the machine, have quick disconnect connectors, and the front panel is easily removed to facilitate filter replacement. Easy connection to a tap water supply for filtered water on demand. Heats water from 25°C (77°F) to 88°C (190°F in 12 minutes, then maintains 88°C (190°F). Cools Water from 25°C (77°F) to 5.5°C (42°F) in 60 minutes, then maintains 5.5°C (42°F). The following results are from water quality tests conducted on water sampled 05/01/05.